Data Center compatibility comes soon! With this version we made a slight adjustment in the app's name, because the term "plugin" was replaced by Atlassian first with "add-on" and then with "app". We decided to completely remove this from the app's name. From this version, you can configure the visibility of the username of the last updater and last viewer. This feature was primarily requested by users in the EU region in order to protect personal information and comply with GDPR. We suggest reading our FAQ about data protection and GDPR in general. Learn more about configuring data privacy. Just update your app using UPM (the app manager built in to Confluence). This version has been performance-tested with the official Atlassian Performance Testing Library. For your interest, we used AWS infrastructure and "c3.xlarge" type standard EC2 instances for hosting the Confluence nodes. The testing confirmed that the app works correctly and consistently in clusters with 1, 2, 4 and 8 nodes (and anything in-between). As a result, Archiving Plugin is a Data Center approved apps launch partner. The new program was announced at Atlassian Summit 2018 (3-5 September 2018, Barcelona). This version is a compatibility release for Confluence 6.10. As you probably know, Confluence does not implement any sort of page view tracking. Because the workflows implemented by Archiving Plugin heavily rely on the last page view information, the app implements its own real-time page view tracking mechanism. Even with this mechanism in place, there was a limitation that confused many in the past. We call it the "abandoned pages" problem. This version introduces a new feature to solve this problem. While this is still impossible to find out what happened before the app's installation (building a time machine is really hard! :-)), you can sensibly initialize the last page view information when building or re-building the content event index! Learn more about page view initialization. Using the "the same as its last update" strategy: it sets the last view for abandoned pages the same as their last update. Please expect the consequences detailed in the next paragraph. Using the "its last updater and a specific date" option with the current date: it sets the last view to today. It is the safest option with no immediate consequences. If the abandoned pages are continue to stay non-viewed, they will be reported after the page view alert interval. Using the "its last updater and a specific date" option with a past date: by setting the last view to some user-given date it finds the abandoned pages faster. Please expect the consequences detailed in the next paragraph. The "not-viewed pages" counts in Content Quality Statistics may increase (with the count of the abadoned pages added). The "not-viewed pages" lists in notification emails may be longer (with the abandoned pages added). Most importantly: if you are using the "not viewed for N days" trigger for page archiving, it may trigger archiving for abandoned pages! If you are worried about these, try the page view initialization feature in a staging system (that has a copy of your production data) first. Overall, as these abandoned pages will now be precisely tracked and reported, you can take actions to make your content leaner and its quality even better. Starting from this version, you can select multiple users as supervisors in any archiving configuration. (In previous versions, you could select only one.) This allows making more than one person responsible for the space, resulting in even better content quality. User interface improvements: the term "actor" is more consistently used, the "archive space's status" selector is more intuitively explained. Content improvements on the built-in Getting Started page. Just update your app using UPM (the app manager built in to Confluence). As a second step, add the missing page view information for the pages without that. This version is a compatibility release for Confluence 6.7. One of the user feedback we received time to time was that users unwantedly edited archive pages because they didn't realize that they are in an archive space's context. To address this, the app gives a clear, but non-obtrusive style to archive pages from this release. It includes a yellowish background color plus an expressive watermark. It is visible both on the wiki pages and in the space's administration screens to discourage "update" type operations. Labels are used for various mechanisms in Confluence. From this version, when a page is moved or copied to the archive space, its labels are filtered to avoid unexpected behaviour. "Not-viewed pages" emails display the "page view alert limit"
"Expired pages" emails display the "page expiration alert limit"
This version is a compatibility release for Confluence 6.4. We are happy to announce that this app version implements the long awaited support for Confluence Data Center deployments! The video below gives a short introduction to running the app on a cluster of 3 Confluence nodes. We first start the Calculate Quality Statistics task on node 1, then demonstrate that its progress can also be watched on node 2 and node 3. At completion, the result becomes visible on all nodes with no latency. Overall, the user experience is 99% identical with the single-server user experience! Without going much into technical details, here is some high level information about how Archiving Plugin works in a cluster. All persistent Archiving Plugin data is managed using the ActiveObjects technology (by Atlassian). It guarantees that all database-persisted data and all changes are transparently replicated among the cluster nodes. Archiving configurations are an example of database-persisted data. 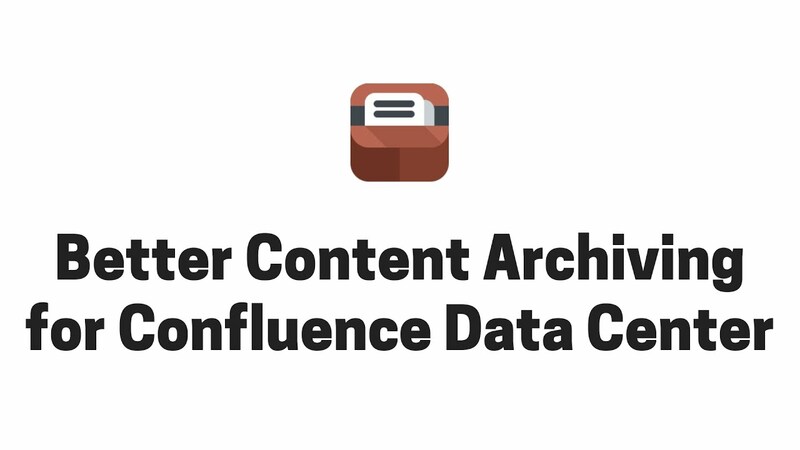 For non-persistent data that need to be shared among cluster nodes, Archiving Plugin uses cluster-wide caches relying on the Cache 2 technology (by Atlassian). It guarantees that all cached data are replicated among the cluster-nodes in nearly real-time. Long-running task state (progress) is an example of non-persistent data. The app's long-running tasks (like the Content Quality Calculation or the Content Archiving task) are executed only on one node in the cluster, generating load only on that single node! At completion, Archiving Plugin makes sure that the task results are replicated to all other nodes. For instance, the refreshed Content Quality Statistics are immediately visible on all nodes. The task parallelization strategy is simple: at any time, there can be max one task being executed in the whole cluster. In other words, there is simply no parallelization. When a node wants to execute a task, it needs to acquire a cluster-wide lock and then release that at completion. Until that lock is available again, no other task can be started on any other node. The idea is to save the cluster from synchronization issues and from unnecessary load. As long-running tasks complete fast since the 6.0.x versions of the app, this simple and robust strategy will not be a limiting factor for through-put. While the actual task is executed on a single node, other nodes allow tracking its progress using so-called proxy tasks. A proxy task on its own node appears like the actual task running on another node, displaying the message, the progress and the result of that. From the user point of view, proxy tasks make transparent whether the task is actually running on the node the user is connected to or on some other node. All in all, the new era of highly-available Content Lifecycle Management has started. Happy clustering! There are two pending issues at the time of the release, that we reported for Atlassian. These are affecting the Archiving Plugin in some negative way, but cannot be fixed in the app side (at least the probability that these can be improved in our side are low). Just update your app using UPM (the app manager built in to Confluence). Please note that after the upgrade you will have to recalculate the content quality statistics, because from this version those are now stored in a new "cluster-ready" database table. In the previous app version (6.0.0), we introduced the so-called data limits to save your server from wasting computing resources (CPU, memory) on irrelevant data. In this version, we rebuilt the end of the data processing pipeline for even more performance and lower memory footprint. This enabled to significantly increase the defaults of the data limits, which are configurable now! Breadcrumbs-style page lists in the notification emails are not supported anymore. You can't displays the ancestors of an expired page, like "grandparent > parent > actual page", only display the actual page. We did for two reasons. First: that's not the Confluence standard. Second: carrying all ancestors with the pages until the mail rendering logic generated extra complication (ancestors are lazy loaded Hibernate objects) and extra use of memory (ancestors are heavy weight), so we're keeping things simple, robust and scalable. Just update your app using UPM (the app manager built in to Confluence), that's all. This release introduces the next-generation app core, that was rebuilt from bottom to top, with scalability in mind. With proper tuning, previous app versions gave acceptable results even on this scale of data, but clearly there was room for improvement. These changes allow scaling even to the magnitude of millions of pages! Although the index does not require any manual care, you need to initialize that the first time, and may need to rebuild that eventually on the go. The index must be initialized when the app is installed the first time, or when you upgrade to version 6.0.0. Until the content update index is built, the app functionality that relies on content updates will not work, for obvious reasons. After the index is initialized, it will be automatically maintained in the background with "micro updates" that are triggered by page updates, attachment updates, and so. In some rare cases, you may want to rebuild the index. This can typically happen when you remove spaces from the blacklist (the index is not maintained for blacklisted spaces), or when you are experiencing troubles with the app features (potentially caused by index inconsistency). You can rebuild the index both globally or for a single space, by clicking the Re-build content update index button in the Content Quality Statistics screen. Starting from this release the app reduces the data to the "actionable" size. It both prevents your users from information overload and your system from wasting resources on useless work. If, for example, you had 100,000 expired pages in 500 spaces, then your users may have received gigantic notification emails with super-long page lists previously. Not only those were unreadable, people just ignored them, due to the "where do I start fixing this?" problem. In 6.0.0, although all the 500 spaces and 100,000 pages are processed, it will intelligently limit the notification emails to the first 20 spaces and to the first 20 pages per space, making it more actionable for the user. A similar mechanism is in place to guarantee that only 50 pages are stored per archiving event. Both the list of spaces and the list of pages per space are limited to the first N items. Previous app versions displayed the complete lists, which is not actionable (will you really update a list with a thousand expired pages?) and may result in multi-megabyte long emails (that may even break some email clients). The new approach is more manageable for the users and scales better for large amount of content. Page lists are sorted alpahbetically, not "by page tree". Previous app versions used complete space traversals to reconstruct the page tree for the emails. This was slow and did not scale well to large spaces. In previous app versions, pages were displayed with the whole trail of their parent pages in the emails, like "Home Page → Finance Report → 2015 → Q1 → Sales". For a shorter list of pages, especially if they were organized into a logical page tree, it was great. For a longer list of pages, it made the list harder to read, plus it does not follow the convention how the Confluence interface displays page lists in general. Performance in this case is a function of several different parameters (and your mileage may vary! ), but let us give you some rough results from our load testing environment. Please note that the environment we chose is relatively modern and powerful, but this is deliberately not a high-end server. Our goal was to stay close to or even "below" reality. In previous versions, no pages found to archive if the archiving configuration specified the "AND" operator between the Page Archiving triggers "Not viewed for N days" and "Not updated for M days", and one of those were disabled. This was a major bug (reported by a user in Italy, thanks!) with a simple workaround: turn the operator to "OR" and it will work as expected. Ultimately, 6.0.0 fixes this. The Content Tools → Page Status is now hidden for regular users. It was previously shown, but required space administration permissions to access. Note: we consider making this accessible by regular users in a future app version, but for now we just made the UI less misleading. Manage blacklisted spaces link is only displayed for Confluence administrators even in space context. Our new performance tuning guide gives you simple to execute instructions to run the app efficiently even in super-large environments. This is important to note that 6.0.0 is also the "groundwork release" for Data Center compatibility. Confluence Data Center support is our most popular feature request at the moment, which requires many of the changes introduced by this new app core, therefore 6.0.0 is a sort of prerequisite for that. Then reset each notification emails to the factory default, due to the email template changes mentioned above. Upgrading to this version is recommended if your Confluence is larger than 30 spaces and 1500 pages. This version focuses on improving the integration with various space themes. By introducing the Brikit Theme Press support, Archiving Plugin now supports all major Confluence themes, including built-in types and the types provided by 3rd party apps. Starting from this version, you can use the Archiving Plugin also in the spaces relying on the popular Brikit Theme Press app. Confluence 6 introduced collaborative editing. The only difference it means for the Archiving Plugin is that any "partial page update" will update the last update timestamp of the edited page. In other words, when any of the users editing the same page at the same time saves his/her "partial" changes, that will make the page current. From that point, everything works just as in previous app versions. "Move" implements the most requested feature to preserve the full version history for archived pages. Thanks for everyone asking for this, we appreciate your patience and your help in finding the perfect roadmap for the app! Keep it comin'! The archiving logic used in previous app versions is now called "Copy and Trash". Even this strategy is faster than it was before, but "Move" is faster in most circumstances and "Trash" is blazingly fast. Turn off the Archiving Plugin for those spaces that are not relevant or have corrupt data, to improve the app performance and stability. The content of all 4 notification emails types (non-viewed pages, expired pages, archived pages, skipped pages) are editable via a web based editor. In previous versions, you could edit the templates by exploding the app JAR, but localization, adding your own content is now super easy. Although the primary aim of the new API is to provide back-end for the app's own user-interface, you are also welcome to use it for your reporting and integration purposes. In 4.0.0, the new configuration experience is based around the concept of triggers ("if a page is older than 10 days" or "if a page labelled with 'foo'"...) and actions (...then "notify its last modifier"), allowing fine-grained settings and eliminating confusion. The rules of "who receives what email" are 100% configurable. To send notifications to users that are not "directly" related to the content (not authors, etc. ), configure so-called supervisors. To route all notifications to a single external mailbox, just set up a Confluence user with that email address and select that as supervisor. Previously, archiving operations (like copying and deleting pages) were executed by a user account automatically selected by the app. It lead to some misunderstanding. This release is updated for the Confluence 5.5 line. In addition, some minor internal glitches were also fixed. Archiving Plugin now also supports the slightly modified Space Administration interface introduced by RefinedWiki Original Theme, one of the most popular custom theme apps for Confluence. This app version introduces a new feature called page view tracking to find those Confluence pages that were not viewed by anybody for a period of time. Discover both outdated (not edited by anyone) and irrelevant (not viewed by anyone) wiki content. Archive that easily to prevent efficiency, productivity and consistency problems.